If you want to teach your child to play the piano , there are several ways of doing it - you can find a piano teacher for them, look up how to play piano online or allow the child to lesson to play piano by ear . This is a healthy skill, as it helps the brain to develop. There are several skills your child will need to learn when playing piano or any other musical instrument. The necessary things for playing piano are proper positioning of the child's hands (otherwise bone injury could occur), proper posture, the ability to read music and the ability to sight-read, ie play a piece without practicing it prior. All of these help the child's brain to develop in intellect and creativity, and are critical to music education. The piano takes a long time to truly become proficient, so ensure that your child's up to the commitment. The keys might look confusing to the child at first, but explain to them that the white keys are normal notes, and the black keys are accidentals. Also, teach them about the musical alphabet: the notes A through G, and tell them the accidentals are the notes between, which is what are played on the black keys. The black keys on a piano won't be used much at first, so start your child off on simple lessons, and teach them proper hand position and posture. Proper posture includes sitting up straight or leaning slightly forward. Also show the child that the fingers need to be relaxed in their natural position. Instruct them to curl the thumb slightly inwards so they're parallel with the rest of the hand. The next thing for a child to learn on piano is basic scales. The most basic scale is a C scale, so show the child where C is - it's a key just to the left of two black keys. Then show them how to play up the white keys with right thumb, index finger, middle finger, and then repeat the process up to the next C. This is a full C scale. This is the easiest way for your child to play a scale with one hand, and it'll teach them finger dexterity. Don't bother with anything like sheet music right now - instead, try to encourage your child to play a TV show theme on the piano, something like the basic Spongebob melody or whatever the favored show is. The important thing is to help them figure out how to play the melody by ear, or playing without music and instead just hearing it played elsewhere. Instruction in reading sheet music can come later on, but it's best to take this part rather slowly. It can be complicated sometimes to a younger child, but as children learn very quickly they can pick up on the basics relatively easily. The child can then learn to read music and play along with it at the same time, and this can provide a healthy sense of accomplishment. At first you may want to consider piano lesson DVD's as they can visually stimulate a child's mind and hold their interest for a longer period of time. Learning any kind of musical instrument, especially piano, is a very rewarding activity for young minds. 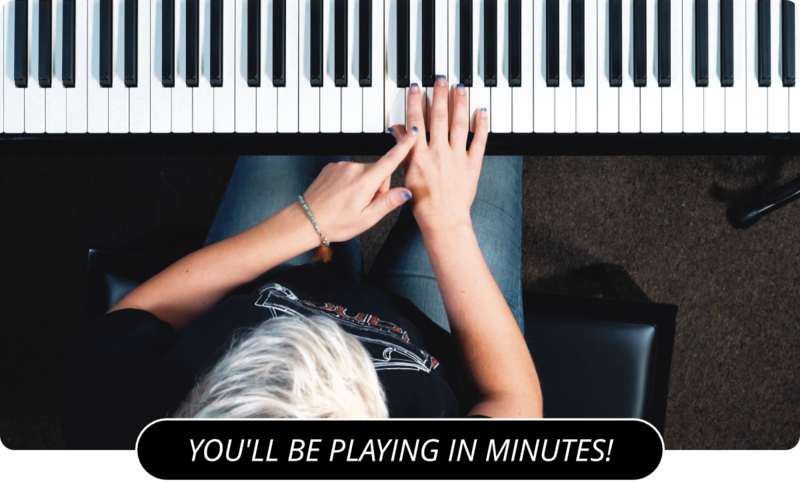 Learn more about beginner piano lessons by visiting the homepage of PianoLessons.com , or by reading through some of the other piano lesson articles we've posted on this web site.